What do you think is the one thing that determines your music career success more than anything else? Is it your musical skills? Is it how many music industry connections you have? Is it how many record company executives know your name and hear your music? Hint: it’s none of the above. The correct answer is:.. your mindset. Your mindset determines every action and every choice you make in your music career (and in your life). Your music career success is the result of your actions and choices, which are the product of your mindset. Successful pro musicians are NOT born with more knowledge or with greater potential than you or anyone else. They simply think differently, take different actions and get completely different results. Anyone can learn to do this, including you. Answer: No. Your mindset is a general term for the way you think, the way you deal with challenges, the way you see the world and the way you make decisions about your music career. When you have an empowering mindset, you choose the right actions that make you more successful every day. If you don’t know what to do to grow your career, your mindset helps you to ask the right questions and look for answers in the right places. When your mindset is just average, you may reach small success in the music business, but struggle to continuously grow your career. When your mindset is poor, you have no chance to get anywhere in the music industry… no matter how talented you are, how great your music is, or who you know in the music business. 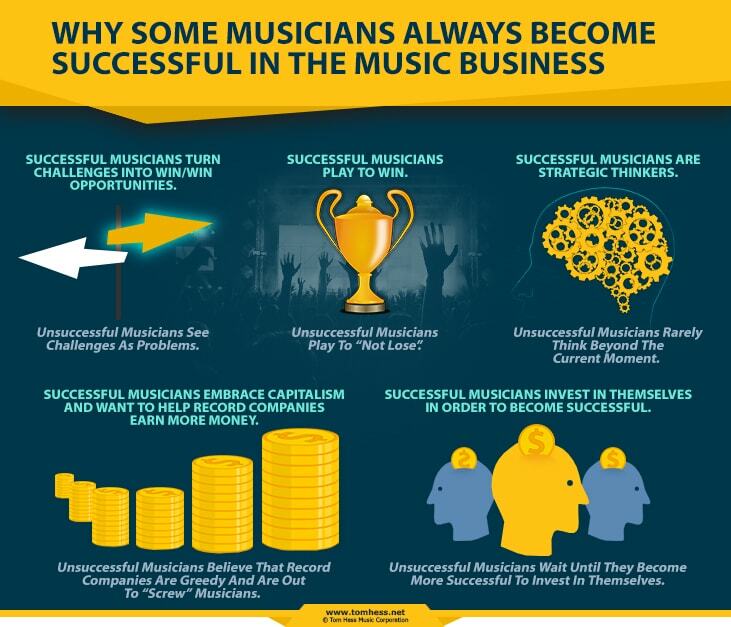 The only difference between them is their mindset: Musician #1 has a poor mindset, Musician #2 has an average mindset and Musician #3 has a rock-solid, success-focused mindset. Let’s look at how a difference in mindset leads to completely different levels of success. This mindset is rooted in fear of failure, instead of desire for success. Musicians who think like this, typically pursue a career in some area totally unrelated to music as their backup plan. They become trapped in their “safe and secure” job until they retire… or until they improve their mindset. Their fear moves them in the opposite direction from their music career goals and hurts their chance of success. Tip: Many people you know likely think just like the musician in this example. They will try to persuade you to create a safe and secure backup plan for your music career just in case you fail. These people mean well, but they don’t know what it really takes to make it in this business. Be careful about taking advice from anyone who has not succeeded at the level you want to succeed. This sink or swim mindset greatly increases your chances of making it in music. When your only options are to succeed or fail, you become driven to do whatever it takes to reach your goals. That said, this mindset is also reckless. While it makes your success more likely, it does little to reduce your chances of failure. If you don’t solve your short-term financial or time pressures, it will be extremely hard to build and sustain your music career. Most musicians with this reckless mindset burn out (or give up) long before reaching their goals. How Secure Is Your Music Career? to being financially secure in music. in music & how to do it for yourself. Doesn't require me to work a lot of hours every week. Musicians with this mindset work hard to build multiple streams of music career income as soon as possible. This mindset gives you much greater control about the direction of your career. 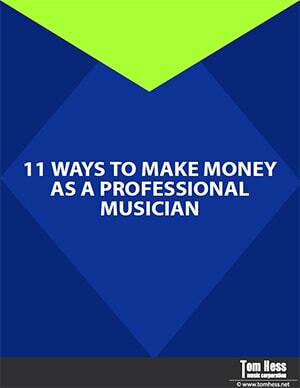 Want to see 11 proven ways you can make money as a professional musician? Download this music career income cheat sheet (it’s free and you don’t have to enter an email address). Print it out and study it, so you know what options you have for growing your music career. Musicians who have this mindset will always struggle to find gigs (and get paid well for them). Club owners won’t pay you more for gigs unless you help them earn more money. Simply showing up and playing your songs doesn't make any money for club owners (unless you are already a successful artist who consistently draws in a large number of fans). This mindset makes it much easier to get the gigs you want. When you can draw a crowd to every gig you play, every club owner and booking agent in your area will want to work with you. However, this mindset doesn’t go far enough to separate you from the average bands in town. Although an average mindset is better than a poor one, it still limits the success you can achieve in your music career. When you have this mindset, you will take VERY different actions to promote your gigs compared to musicians 1 and 2. More importantly, you will get much different (and better) results. Attract more people into the venue and enable club owners and booking agents to earn more money. Since you have additional motivation to work harder to promote your gig (increased merchandise sales), you’re more likely to get people to your show. Make more money overall (from the fee you are paid for the gig + merchandise sales). Not be as concerned about how much money you are paid for the gig itself (because you make money in different ways before, during and after the gig). Make it much easier for you to get the gig, because you can afford to do it for less money than other musicians. You make up the difference on the back end. Since you can now take on more gigs, you build your fan base faster. Build stronger relationships with booking agents, club owners and your fans. This makes it easier to get bigger and better gigs in the future. Want to learn 8 proven ways that will get you more gigs (and better paying gigs)? Download this free music career eGuide to learn how to make very good money playing live. Musicians with this cynical mindset shift responsibility for their success on other people and circumstances. They make excuses, instead of taking personal responsibility and changing their situation for the better. This mindset reflects self-reliance, personal responsibly and work ethic (all of which are needed to succeed in the music business). This will help you get much further in your career compared to the cynical, entitled mindset of many musicians. However, hard work by itself doesn't lead to long-term success. Many musicians fail in the industry, because they don’t have the right strategy to reach their goals. It doesn't matter how much (or how little) you know about the music business right now. Success-focused mindset helps you learn what you don't know and get you on the right track towards your goals. Download this free eGuide to learn how to make a great living as a performing musician. About Tom Hess: Tom Hess is a music career mentor, guitar teacher and guitar teacher trainer. He mentors musicians from all over the world how to build very successful careers in the music industry and conducts live music career training events attended by musicians from 50 countries. Learn what it really takes to make it in the music business.